Wood is still the material we associate most with toys. The natural color and feel of wood has a unique appeal to human beings. Show someone a wooden toy and they instinctively reach out and touch it. This is not the case with plastic or electronic toys. Children wooden toys convey the message of back to basics play values. Simple toys with natural appeal that only require imagination when kids play with them. The look, shape and feel of these toys appeals to kids everywhere. So children wooden toys excel in that prime requisite for all toys – child appeal. As of a result of their mode of manufacture, most wooden toys are constructed in simple shapes. 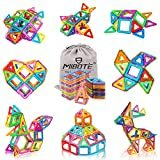 This is wonderful for toddlers as they get to look and feel cubes, cylinders, cones and oblongs by playing with their toys. Both natural wood and colored wooden toys are attractive to our youngsters. Children wooden toys that have been painted and varnished exhibit a depth and variety of color that you don’t find in other toys. Children wooden toys use hard woods and are very durable. They are often skilfully designed so that additional pieces can expand the use a child will gain from these toys. There is tremendous variety in the range of children wooden toys available today. 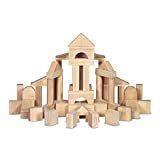 Simple shapes and blocks; puzzles; cars, trains and boats; dolls houses and toy forts; hobby horses and wooden play figures are all available made in the most natural of materials. 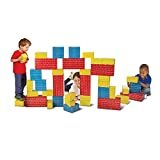 Here’s a simple game your toddler can play with wooden blocks. Build a loading bay for their toy trucks. The structure needs only to be two walls of blocks with two cross pieces laid across both walls. The walls need to be wide enough apart for trucks to drive between them and higher than the height of the tallest truck. Kids love to drive their trucks into the bay and then drop smaller blocks between the cross pieces into the trucks. 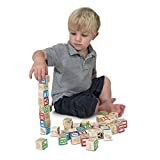 A degree of dexterity is required and your child will enjoy testing which blocks can be loaded. You’ll love the conversations that take place between the driver and the loader. Besides ordering a specific quantity of blocks, the driver will tell the loader what he had for breakfast and answer enquiries about his wife and family. Of course, there are adventures. Trucks will break down in the bay or spill their loads. It’s inevitable that the bay will be crashed into and have to be rebuilt. Always try and pick children wooden toys that are of a good quality. Those that are well made from a hard wood will prove to be durable and long lasting toys. Soak their hurt finger in warm water with antibacterial soap. The splinter will be easier to remove once the skin is softened. Distract your toddler by asking them to look away. Sing a song, count or recite a rhyme while you gently prod the splinter with a sterile needle. Look for bright colors and appealing shapes that will attract your kids to the toy. I always prefer simple but realistic toys that a young toddler finds easy to manipulate. To play with these demands imagination but with some help from yourself, youngsters will learn so much and really enjoy these toys. The term hardwood is used to describe the wood derived from deciduous trees – those that loose their leaves in the fall. Softwood comes from coniferous trees like pine and spruce. Although hardwood timber is generally harder to cut than softwood there is tremendous variation. Yew is a softwood that is harder than many hardwoods. Balsa is from a hardwood tree but is very soft. When he was three, our eldest son was so engaged in one of our imaginary games that he hit me over the head with a small coffee table. It was made of pine but I can testify that it was hard! Backhoe Ride On toys – Excavators to excite everyone. Prices are accurate as of April 25, 2019 11:09 pm. Product prices and available are subject to change. Any price and availablility information displayed on Amazon.com at the time of purchase will apply to the purchase of any products.